Guest blogger, Joni Sensel writes about cutting her story so much that two books became one. I read an ARC of this new book and loved it — the novel revisions worked! Why Cut Out Important Parts of a Novel? 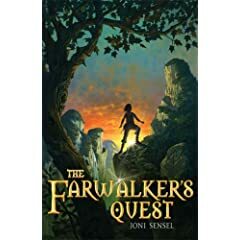 Originally I thought my new middle-grade adventure, THE FARWALKER’S QUEST, would be two books of a trilogy, in part because the first draft was 121,000 words. Cut out 20,000 words. Nope. Among my agent’s earliest feedback was that I needed to combine the two halves, prop up sags, and try to get it under 100,000 words. Once I managed that, my editor wanted it trimmed even farther. The final book is just under 93,000 words. Though I wouldn’t have thought it possible when I started, I cut more than 20% from the original and upped the pace considerably. In the process, I learned to rely on several techniques that go beyond the standard advice to slash adverbs or use one perfect description rather than three. Even if you’re not as long-winded as I am, cutting virtually always increases pace, and few stories suffer from too fast a pace. Use chapter breaks. What can you leave out between chapters? THE MARK OF THE HORSELORD by Rosemary Sutcliff taught me a huge lesson. This favorite of mine makes huge leaps in story time between the end of one chapter and the start of the next. In some cases, she left out things I wanted to see. (But did I need to see them? Obviously not.) Generally, it worked well and kept the action hopping. I think we tend to live with our characters minute by minute, but readers only need the relevant moments. Examine your manuscript with the big picture and key events in mind, and give your readers credit for being able to make accurate assumptions about what happens in the interim. This approach helped me cut some of the travel with my characters from one plot point, mood, or physical location to the next. Similarly, rethink scene transitions. My favorite screenwriting trick is to start scenes later and leave them sooner. Readers will correctly assume the mundane things that happened before or after the good (unexpected) stuff. For instance, if we know the main character plans to or is headed to visit another, that scene can begin with an important line of dialogue from the middle of their conversation instead of the arrival and broaching of the subject. You’ll still need transitions, of course, but you can cut significantly this way. Streamline action details. Particularly in scenes of physical action — for instance, a scene in which Ariel has a knife at her throat — I have a tendency to imagine and write what’s happening in great detail because I don’t want the reader confused. But with prodding, I’ve realized that sometimes, details obscure. A firm suggestion to shorten the scene often reveals that I’m telling the reader things they’d assume anyway. When those details are removed, the action feels more intense because the whole scene moves faster. Remove dialogue attributions (“he said”) in favor of action lines that, if not already there, are often not far away and can be moved. For instance, “Scarl!” Ariel called. He looked up. She ran forward.” can become “Scarl!” Ariel ran forward. Attributions for longer lines of dialogue can be less obvious but just as easy to cut. They add up. It can be okay to tell. Both editors I’ve worked with have told me, in essence, “Sometimes I wish ‘show, don’t tell,’ had never been invented.” Writers who have already learned to do a good job of showing can save words by occasionally telling. Choose judiciously. Sometimes, Ariel didn’t need to have her skin go clammy and the nape of her neck prickle — she could just be scared. Do multiple passes. Even after I think I’ve squeezed out every spare word, I still see more I can live without. Would I prefer to keep that word or line? Sometimes, yes, but I choose my battles. Other times I can see immediately that shorter is sweeter. The reward has been readers who have told me my books were page-turners. Hearing those words makes it worth cutting a few thousand others. And, yes, it worked well because The Farwalker’s Quest is wonderful. This was GREAT! Thanks for sharing, Joni. The one I liked best was “It’s OK to tell.” I so agree with your editors. Balance, authors. We need balance. Thanks for the excellent advice. Perfect timing, as I’m in the middle of a novel revision right now! I am so happy to hear the advice that an author doesn’t always have to “show don’t tell”. If everything thing in the manuscript is a scene…there turns out to be lots that can be cut. Thanks! Oh, this is all AWESOME advice, Joni. I’m so happy to read it right now, as I fear my w.i.p. wants to be two books when I just want it to be one! I cut a ton of words out of my last book, and learned some ruthlessness, but these are some great tips I haven’t really thought of. Hi Joni! Laini sent me the link here. What fantastic advice — several things I’ve never thought about before. Thank you, thank you, THANK YOU! Laini sent me over, too — this is great advice, and I’m sort of gobsmacked Joni had to cut SO MANY words, but she really made it work. Wow. Laini’s sending all of us here! Great advice. Thank you!